PRESS RELEASE: COHASSET, MA - June 1, 2018 - Jett Foundation’s Tri4Jett triathlon team members will be competing in the Cohasset Triathlon on June 24 with their hero and namesake, Jett McSherry, a 22-year-old who has Duchenne muscular dystrophy. This is Tri4Jett’s sixth year competing in the Cohasset Triathlon and raising funds for Jett Foundation, and McSherry’s second year. At age five, McSherry was diagnosed with Duchenne, a rare muscular deterioration disorder that increasingly limits muscle functionality. Having lost ability to walk and almost all muscle function, McSherry has been limited to a power chair since he was 12. However, teammates will help McSherry defy odds this June when he competes in the race for the second year in a row. The Tri4Jett team is looking for volunteers and participants to join them on June 24 to help with transitions, encouragement, and fundraising. The team is thrilled to have their hero and inspiration training and participating with them again this year. 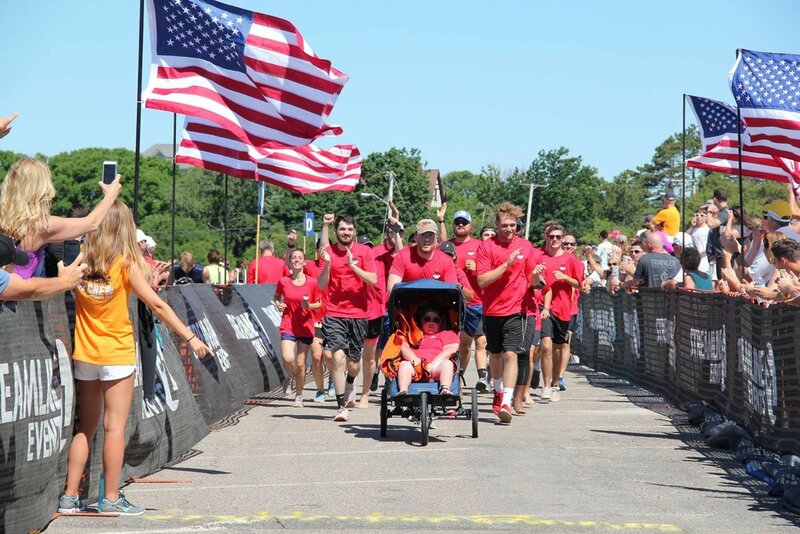 McSherry’s Bridgewater State University roommate and close friend, Josh Dyer, will be alongside McSherry every step, pedal and stroke of the way. Through the help of friends and the community, each teammate, including Jett, has been raising funds to participate in the triathlon. The team’s major sponsors include Perky Jerky®, The Goodale Company, Inc. Insurance, and Shea Concrete Products. To join the Tri4Jett team, please visit https://www.jettfoundation.org/tri4jett-2018/. To learn more and to donate to the Tri4Jett team, please visit https://www.firstgiving.com/event/11421/tri-for-jett-2018. Diagnosed during childhood, Duchenne is a progressive neuromuscular disorder that causes a loss of motor, pulmonary, and cardiac function, and premature death. It affects one in every 3,500 live male births and some females. Duchenne has no cure. Children with Duchenne are born seemingly healthy and decline over time, usually losing their ability to walk around the age of 12 and succumbing to the disease in their early to mid-twenties. Since 2001, Jett Foundation, a nonprofit located in Plymouth, MA, has worked to extend and enrich the lives of individuals affected by Duchenne muscular dystrophy and other neuromuscular disorders. It does this by partnering with families impacted by Duchenne muscular dystrophy through empowering educational programming, transformational direct service experiences, and by accelerating development of life-changing treatments. For more, visit www.jettfoundation.org.